As a kid, you never listened to your mom when she told you that you should brush and floss your teeth twice a day – and now, you have some noticeable blank spots in your smile. Although you’ve been practicing excellent oral hygiene at home since the tooth loss began, this can’t undo the damage already done, but a dental implant in Cocoa Beach, FL can. In this post, the team at Nawrocki Dental explains how you can replace 1, 2, or a whole row of missing teeth with this superior prosthetic option. How Many Teeth Can I Replace With Dental Implants? Single-Tooth Implants – In this instance, only one tooth is replaced with an implant, eliminating your need for partial dentures or fixed dental bridges. Multiple-Tooth Implants – If you’ve lost more than one tooth in a row, we can use an implant supported dental bridge. And, if you have teeth that are missing throughout your mouth, we can use multiple implants to fill in the gaps. Full-Mouth Implants – With implant-supported dentures, we’ll place posts in strategic positions in your jaw that will connect with your replacement teeth with just a snap. In some cases, we may permanently affix the arch of artificial dentitions to your implant posts. #1 – Titanium Implant – The term implant itself actually refers to the biocompatible post that will be surgically placed in your jaw. After about 3-6 months, this will fuse to your jaw in a process called osseointegration, making the implant strong and improving your bone structure. At that point, the other pieces can be added. 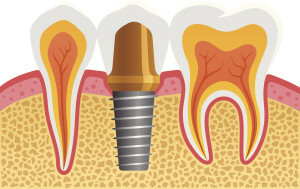 #2 – Abutment – Once the implant is study and secure enough, the abutment can be added. This is the connecting piece that links the implant post to the tooth-shaped cap or snap-in dentures that will look and function like your natural teeth. #3 – Dental Crown or Snap-In Dentures – At the same appointment when the abutment is added, Dr. Nawrocki will place your dental crown, fastening it to the abutment. This durable porcelain cap will blend right in with your smile, and will stay in place, giving you back the smile you had before you experienced tooth loss. If snap-in dentures are right for you, you won’t receive a dental crown, but use the full arch of replacement teeth to reclaim your grin. Now that you know that dental implants are the best solution no matter how many teeth you’re missing, schedule your appointment with Nawrocki Dental today – we’ll give you back the healthy, life-like smile you deserve!